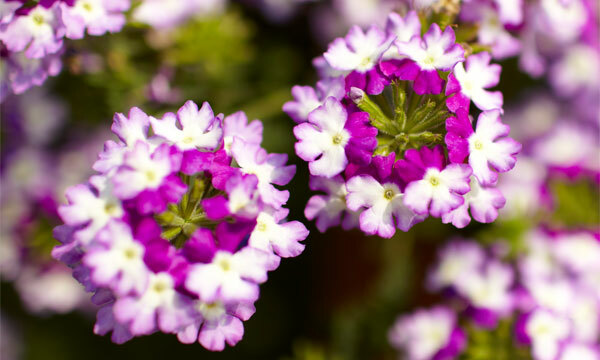 Gardening NewsHome » News & Posts » News & Posts » Verbena Lanai™ Blue Twister – New for 2014! Trailing Verbena is a fantastic basket plant with vibrant coloured flowers and a good trailing habit. The Lanai™ range is particularly good as it has strong resistance to downy mildwew. Blue Twister is a new addition to the range for 2014! Blue Twister has white flowers with a ring of blue/purple colour around the centre of the flower. Blue Twister’s unique flowers will look amazing in hanging baskets! We would recommend planting 4 or 5 plugs in a 12″ or 30cm hanging basket for a wonderful display. You can read our step by step guide to planting a hanging basket here. To learn more about growing Verbena from plug plants have a read of our guide. In the garden trailing Verbena plants prefer a position in full sun or partial shade. They need feeding weekly whilst flowering, and must not be allowed to dry out. It is best to water in the mornings or evenings instead of when the sun is at its strongest, to avoid scorching the leaves. You can find all of our plugs online here. What do you think of Blue Twister? Leave your comments below! previous post: Geraniums – New for 2014! next post: New Guniea Impatien Harmony® Radiance Pink – New for 2014! Home » News & Posts » News & Posts » Verbena Lanai™ Blue Twister – New for 2014!